River Court is surrounded by beautifully landscaped gardens. 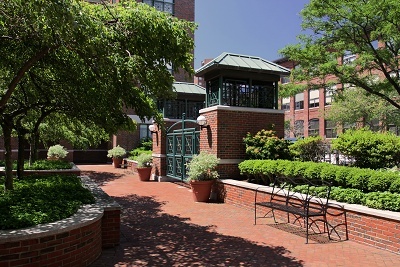 The front courtyard was designed to enhance the beauty and splendor of River Court. The flower beds are changed often to represent the ever changing seasons of New England. The back courtyard is complete with a reflecting pool and flowering trees. Colorful tullips bloom in the spring and the beds along the fence are illuminate to showcase their plantings. Additional photographs of our gardens and fountain can be seen in the Photo Gallery.